How Healthy Is Iceberg Lettuce, Exactly? There may not be much love for this classic salad staple in health circles, but it’s not as bad as you might think. Iceberg lettuce often gets a bad rap—while the classic leafy green is a staple in wedge salads, it gets a lot of flak from fiber-conscious kale fans. Some call it tasteless, watery, even completely devoid of nutrients. Given the choice, most health conscious individuals tend to pick other types of lettuce. But why? Is iceberg lettuce really that bad for you? Let’s take a closer look at the nutrition of this common salad green, and see how it stacks up against other lettuces, as well as leafy greens like spinach and kale. First off, iceberg lettuce is composed of 96% water—similar to celery and cucumbers. This makes it great for getting in extra hydration during hot days. 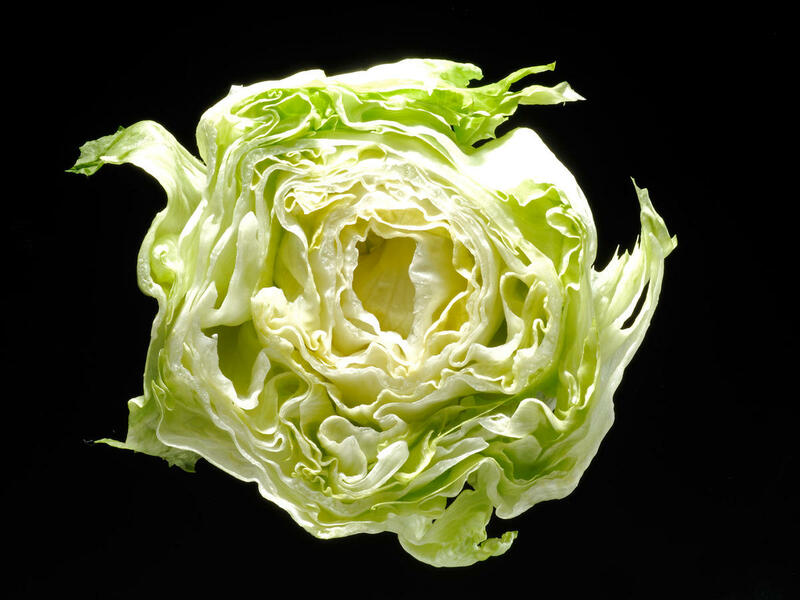 Iceberg lettuce has a crisp texture and cooling effect, both of which are good indicators of its higher water content, according to nutritionist Carolyn Williams, PhD, RDN. “However, because iceberg lettuce is mostly water, this doesn’t leave much room for even minimal nutrients,” says Williams. To give you a comparison point, kale is only 84% water and spinach is 95%. Both have a thicker, leafier texture than lettuces like iceberg, Romaine, and bibb. “Lettuce in general has a high water content and doesn’t consist of much—especially when compared to spinach or kale,” Williams says. So, how exactly does iceberg lettuce stack up against two of our favorite leafy greens—spinach and kale? Here’s a breakdown of key nutrients and vitamins in each one (per 100 gram or 3 ½ ounce serving). Iceberg lettuce is lower in calories per serving, but it doesn’t deliver nearly as powerful of a dose of nutrients as spinach or kale. In fact, it doesn’t even come close. But sometimes a recipe calls for something other than kale or spinach. Whether it’s lettuce wraps, fish tacos, a BLT, or a classic cheeseburger, some foods are just better with lettuce. But here’s the ultimate question—is there a healthier lettuce to use instead of iceberg? How does the nutrition of iceberg lettuce compare to other lettuces like Romaine, bibb, or green leaf? While the difference isn’t quite as dramatic as spinach or kale, iceberg lettuce is still lower in nutrients than other types of lettuces. While calories, protein, and fiber are relatively similar, the biggest difference between iceberg lettuce and other lettuces lies in the amount of vitamins and minerals. Compared to iceberg lettuce, Romaine lettuce contains nearly twice as much Vitamin A and four times the amount of Vitamin K. So, if you’re making a recipe that calls for lettuce—and if it makes sense to substitute in a different variety, you may want to consider doing so. Are there any benefits to eating iceberg lettuce? Potentially. While iceberg lettuce lacks the nutrient density of spinach, kale, and even Romaine, it’s the lowest in calories. This may be beneficial to those who are trying to lose weight—since you can’t really put a cap on the amount you can consume. Additionally, the high water content of iceberg lettuce makes it a naturally hydrating food. While this shouldn’t take the place of your normal water intake, adding several leaves to your sandwich when it’s hot outside may not be the worst idea. Iceberg lettuce isn’t as bad for you as you may think. It's actually a perfectly healthy food, and if you like the taste, you should include it in your meals. But there’s not a whole lot of substance to it. However, due to its high water content, iceberg lettuce is less nutritionally dense than dark leafy greens like spinach or kale. It is very low in calories, but keep in mind that there are healthier lettuces out there (such as Romaine lettuce) that are relatively similar in calories. If you’re going to eat iceberg lettuce, that’s fine—but just avoid tossing it with creamy dressings packed with fat and make sure you’re pairing it with other nutrient-rich foods.